Persistence Market Research, in its report titled “Piling Equipment and Supplies Market: Global Industry Analysis 2013–2017 and Forecast 2018–2026”, offers detailed insights and in-depth research on the Piling Equipment and Supplies market for an 8-year forecast period, i.e. 2018 – 2026. The report covers the important factors driving the growth of the Piling Equipment and Supplies market, untapped opportunities for Piling Equipment and Supplies manufacturers, trends and developments shaping the dynamics of the Piling Equipment and Supplies market and other insights across various key segments. The report identifies the drivers and restraints affecting the growth of the Piling Equipment and Supplies market. Changing trends have also been analysed and incorporated in this Piling Equipment and Supplies report to equip the client with exhaustive information about the Piling Equipment and Supplies market. Macroeconomic factors that directly and indirectly affect the growth of the Piling Equipment and Supplies market have also been incorporated in the report. The market value for all segments is taken in US$ Million and the market volume for piling equipment is taken in Units and piling supplies is taken in Kilo Tonne (KT). A section of the report highlights region-wise Piling Equipment and Supplies demand. It provides market outlook for 2018-2026 and sets the forecast within the context of the Piling Equipment and Supplies market. Further, various factors, such as GDP outlook, construction industry’s growth across various regions and its impact, have also been provided in the report. Moreover, every respective region has been analysed on the basis of various segmentations, such as equipment type, capacity, application, platform, and piling products and country. In the final section of the Piling Equipment and Supplies report, a competitive landscape has been included to provide report audiences with a dashboard view. The report provides detailed market share analysis of the Piling Equipment and Piling Supplies market on the basis of tiers. 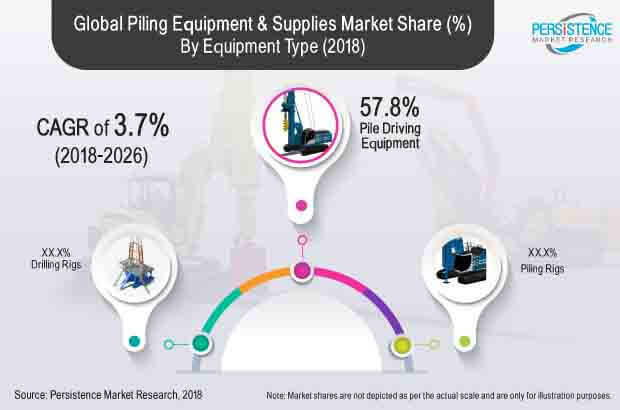 Comprehensive profiles of manufacturers have also been included within the scope of the report to evaluate strategies, key offerings and SWOT analysis in the Piling Equipment and Supplies market. Market volume of Piling Equipment and Supplies has been inferred through in-depth secondary research and validated from industry experts through primary interviews. Each interview was thoroughly analysed and average market volume was deduced and reconfirmed prior to incorporation in the report. The average price of Piling Equipment was deduced based on equipment type, where the average price was inferred across all the five assessed regions, and for piling supplies, it was deduced on the basis of piling products. The market value of the Piling Equipment and Supplies market was, thus, calculated from the data provided by the average selling price and market volume. For the 8-year forecast of the Piling Equipment and Supplies market, various macroeconomic factors and changing trends were observed, giving an idea about the future of the market. Other important factors considered to arrive at market forecast are the size of the current market, inputs from the demand side and the supply side and other dynamics shaping the scenario of the market. In the report, the forecast has been conducted in terms of CAGR, while other important criteria, such as year-on-year growth and absolute dollar opportunity, have also been incorporated, presenting the client with crystal clear insights and future opportunities as far as the Piling Equipment and Supplies market is concerned. The Piling Equipment and Supplies market is divided into piling equipment market and piling supplies market. Further, the global piling equipment market is classified on the basis of equipment type, application, capacity, platform and region. The global Piling Equipment market value is estimated to reach approximately US$ 1,076.6 Mn by the end of 2018. The Piling Equipment Market value is expected to register a value CAGR of 3.7% over the forecast period (2018–2026). On the other hand, the global piling supplies market is classified on the basis of piling product and region. The Global Piling supplies market value is estimated to be approximately US$ 4,040.3 Mn by the end of 2018. The Piling supplies Market value is expected to register a value CAGR of 4.5% over the forecast period (2018–2026). The global construction industry is registering steady growth due to high rate of urbanization and increasing demand for roads, rails, buildings, etc., as a result of growth in population. Governments of various economies across the globe are focusing on the development of transportation infrastructure. Therefore, initiatives of governments will boost construction projects across the globe, which will result in growth of the pile foundation work, which in turn, will fuel the demand for piling machines. Mining activities in countries, such as China, Malaysia and Indonesia, have slowed down in recent years due to stringent government regulations in these countries. This has led to increasing activities in terms of exploration, excavation and mining of minerals and metals in other regions to close the supply-demand gap for such products. This, in turn, has led to increasing demand for geotechnical and foundation equipment to access deeper mineral deposits as well as stabilize soil structure around mines. Key players in exploration and mining are increasingly focusing on countries, such as Canada, Tanzania, Zimbabwe, Australia, Mexico, India and South Africa, for mining bauxite, graphite, gold, platinum and uranium, among others. Hence, exploration activities in these countries are expected to drive demand for anchoring equipment and piling sheets over the forecast period. The global Piling Equipment market is segmented by equipment type, capacity, application, platform and region. On the basis of equipment type, the global Piling Equipment market is segmented into piling rigs, pile driving equipment and drilling rigs. On the basis of capacity, the global Piling Equipment market is segmented into 25-40 kNm, 40-150 kNm, 150-250 kNm and above 250 kNm. On the basis of application, the global Piling Equipment market is segmented into civil engineering, construction and utilities (including renewable). On the basis of platform, the global Piling Equipment market is segmented into clay, pebble bed and rock. On the basis of piling product, the global Piling Equipment market is segmented into pipes, structural beams, sheets and combi-wall systems. Based on region, the global Piling Equipment and Supplies Market is segmented into North America, Europe, Latin America, South East Asia & Other Pacific (SEA), Middle East & Africa (MEA), Japan, and China. In terms of value, pile driving equipment of the Piling Equipment segment are estimated to dominate the market with 57.8% share in 2018 end and will continue to dominate until the end of 2028. The Global Piling Equipment market is expected to touch US$ 824.2 Mn by the end of 2026. By piling product, sheets segment is estimated to dominate the Global Piling Supplies market by accounting for a value share of 50.6% by 2018 end. The report highlights and discusses some of the top companies operating in the global Piling Equipment and Supplies market, such as BAUER Maschinen GmbH, Liebherr Group, Boart Longyear Limited, Sany Group, Mait S.P.A, Casagrande S.p.A., BSP International Foundations Ltd., among others.